CONELECTRIC is a big company lean to make installation and manteinance for aerial and subterranean lines of high and low voltage, transformer centers, industrial, and comercial power and air conditioning installations. The business lines of CONELECTRIC are ready for large installations and it has a large highly qualified team. Installation of medical gases, surgical equipment, data connection. Electricity, control panels, instrumentation and welding. We carry out any electrical installation, airlines and underground high and low voltage. Manufacture of electrical switchboards, distribution and folding muddy. Control panels, monitoring, automation, instrumentation and military welding. 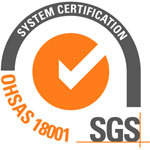 The new certificates of quality management system applied to our work ensures the highest level of satisfaction for our customers and suppliers, wich are added to the OHSAS 18001. CONELECTRIC recorded zero accidents for the fourth consecutive year. The certificate of quality management system applied to our work ensures the highest level of satisfaction for our customers and suppliers. Finished the installation of electrical, instrumentation, control panels, instrumentation and welding Repsol refinery in Tarragona.